This is the first Mayones sent my band - Binary Code - in 2016; the most dashing top I've ever owned. Quilted maple has such a great complexity to its dimension; you really need to get your eyes up close to it to see the dune-like quality to it. 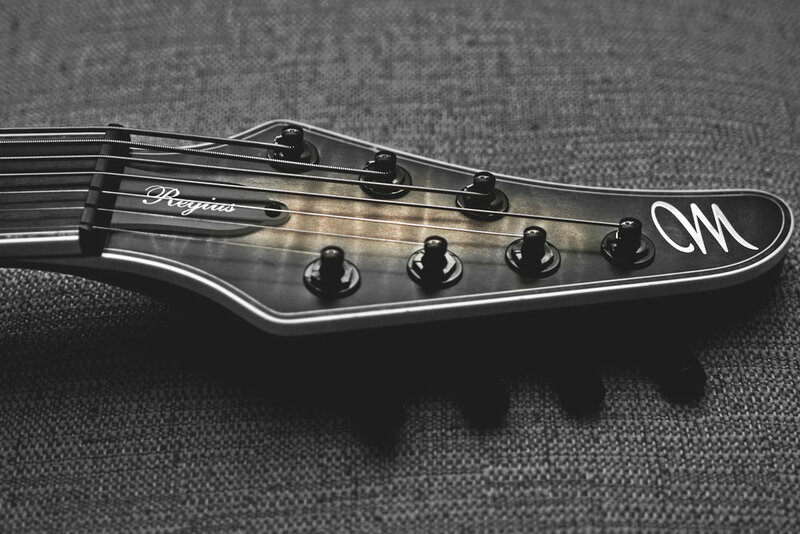 The neck has an almost human-like feel to it; 11-ply construction gives the guitar incredible relief stability. I'm very fortunate to have worked in the musical instrument industry for all of my working life (16 years as of 2018). I've had a chance to hold the nicest instruments built in the entire world, which has given me quite a standard for guitars I personally use. When I first saw a Mayones guitar in the hands of my friend Bart from the band Textures, I noticed how much it looked like a refined version of what I thought was the highest caliber guitar at the time. Years later, I started officially using "Mayos" and can attest to the master craftsmanship. This guitar features dual Juggernaut pickups, designed by Bare Knuckle Pickups and Misha Mansoor from Periphery. They're ceramic and alnico, which lends a great balance of tone and capabilities that not many other pickups in the contemporary market offer. Naturally, this guitar also has push-pull function for moments when I need a strat/twang tone. Hipshot SK1 Tuners: Avoid Tuner Snagging! My original idea behind using the SK1 tuners by my friends at Hipshot Products was to avoid having my tuners banged into or snagged by cables/hair/etc. These tuners are knurled metal and resemble a tire valve cap more than they do a Kluson-style tuner. The lack of the wing-like structure helps avoid detuning if bumped into. Such SMOOTH tuning increments!